Difficult to find NEW CONSTRUCTION! Home should be completed around the end of April. 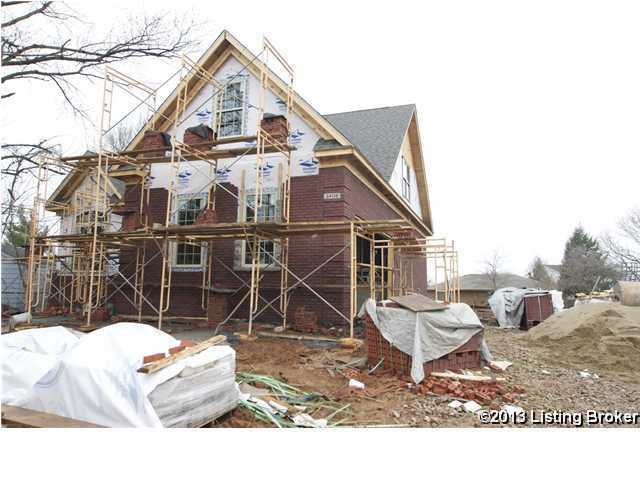 This beautiful 4 bedroom, 2.5 bathroom custom built, brick, stone and siding home has an open floor plan, a full unfinished basement and attached 2-car side entry garage! This home features an eat-in kitchen, breakfast bar, pantry, vaulted great room w/ fireplace, nice size master, private master bath w/ dual sinks, whirlpool tub, tiled shower & large closet, two story entry, spacious additional bedrooms & baths & open catwalk. Upgrades in this home include beautiful engineered hardwood floors, decorative tile, molding, & more! The full basement features a huge daylight window. The exterior will have a patio & a nice flat yard. Convenient to expressways, shops, & more! Breckenridge Estates is a subdivision within the city of Louisville, Kentucky. There are currently 3 Homes for Sale within Breckenridge Estates, with asking prices ranging from $199,900 to $217,900. The average list price per square foot of the available inventory in Breckenridge Estates is $102, which is below the Louisville average of $157. The Average Sales price of all sold real estate in this subdivision for the past year is $208,678. Recent comparable homes have been selling for 99.15% of their asking price. Waterfront homes represent 66.67% of the available Breckenridge Estates inventory. The population of Louisville, according to the 2010 Census, is 597,337. The total number of households in the zip code of Breckenridge Estates is 14,512, with an average household size for of 2.23 people. The total number of renter households within the zip code of 40220 is 5,216, which means that 64.06% of households in this zipcode are owner occupant households. 3408 Hunsinger Ln, Louisville KY 40220 is a Home, with 4 bedrooms which is recently sold, it has 2,036 sqft, 0 sized lot, and 2 Car Garage,Attached parking. A comparable Other, has bedrooms and 0 baths, it was built in and is located at and for sale by its owner at $ 0. This home is located in the city of , in zip code , this County Other, it is in the Subdivision, and Stony Brook Woods are nearby neighborhoods.